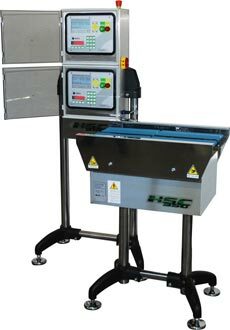 NEMESIS presents the new HSC350 checkweigher – T series available from two up to four individual weighing lanes. The multi-lane design allows for an higher throughput than a standard single lane checkweigher saving space with a compact footprint. Integrated scale controls housed in industrial or food-grade enclosures are able to receive, interpret, and display accurate weights form each load cell on all lines simultaneously and independently. A new option to weighing higher quantities allow for a much greater production yield while still maintaining strict quality control of 100% of the items produced.